July 1st Body Rock ATX is BACK!! It’s hot as hell and that means we’re ready to pay tribute to two of our favorties! First up, Mr. Hotter than July himself: Stevie Wonder! Plus we’ll throw in Stankonia kings: Outkast!! DJ CHICKEN GEORGE will join us on the main stage PLUS the one & only Nick Nack will hold down the patio stage ALL NIGHT! 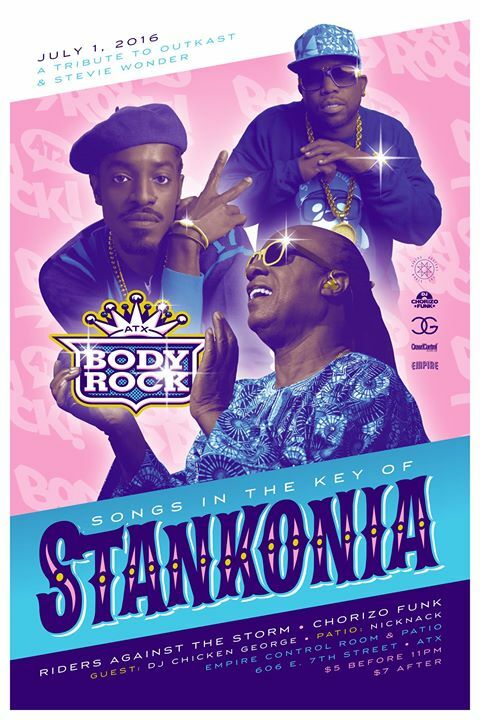 WHAT: Body Rock ATX presents: Songs in the Key of Stankonia. A tribute to Outkast & Stevie Wonder. W. special guest DJ Chicken George. & NickNack on the patio. doors at 9pm. Tribute starts at 11:30ish.